Fifty years. That’s a very long time. For a book to still be alive, vibrant, and read all over the world – fifty years later – is astounding. 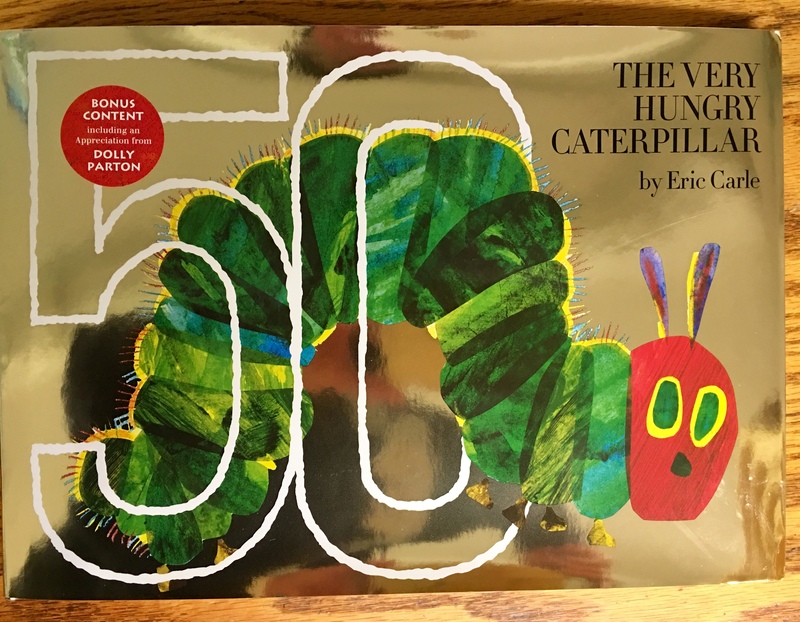 The Very Hungry Caterpillar by Eric Carle is celebrating it’s 50th anniversary this year, with a golden book jacket. The caterpillar in the story wasn’t always a caterpillar. Initially it was a worm, and the book was titled A Week With Willi the Worm. The editor wasn’t crazy about a worm. 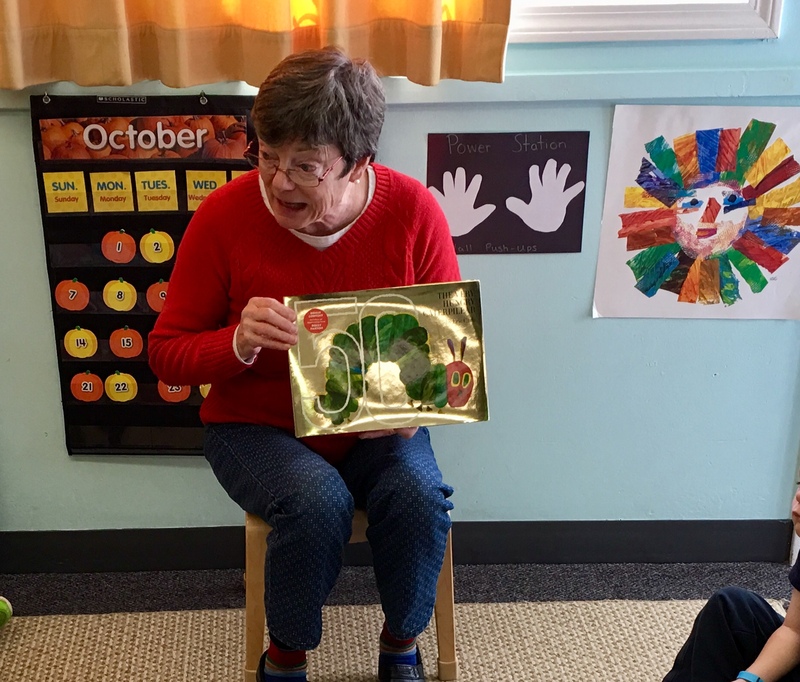 When she suggested a caterpillar, Carle immediately said butterfly, and the story was born. 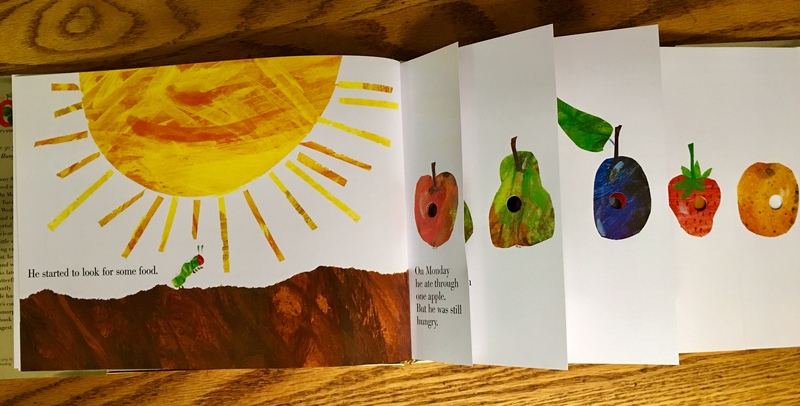 The favorite part of the book for children, also a nightmare for the publisher, is the five pages of fruit for each weekday – with a hole through the fruit. Carle’s inspiration came from using a holepunch at work. “…but he was still hungry”. Today the book has been translated in sixty-two languages and has sold more than forty-six million copies. More than one copy of the book is sold every minute. Those statistics are mind boggling. Why is the book so successful? The illustrations are beautiful, especially the butterfly. The text is predictable, yet exciting. The story is really about life – being born, learning along the way with mistakes, right and wrong, and also the wonder of what happens when we emerge into the person we want to be. Isn’t that what children want to hear about? Aren’t those the important things? That’s what we need to read to children. 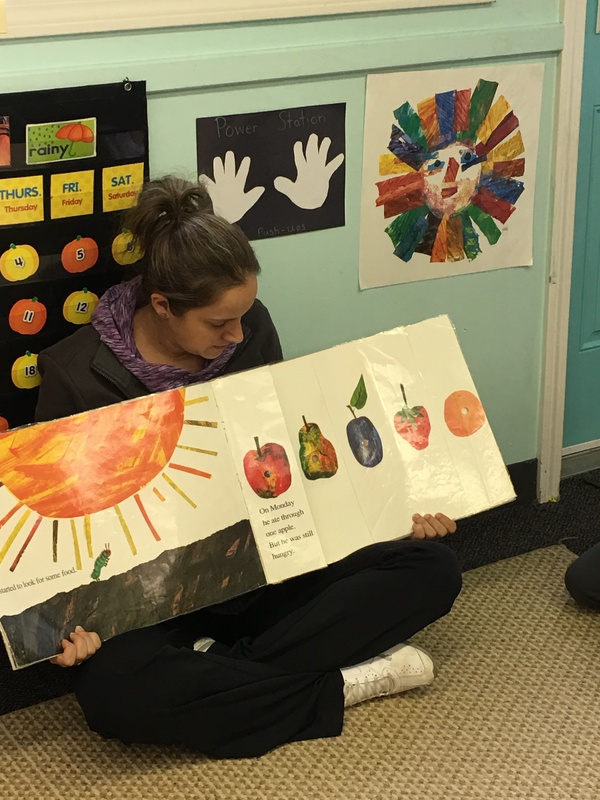 The youngest of children enjoy the story, and so do older children. If you haven’t read the book in a while, I highly recommend it. 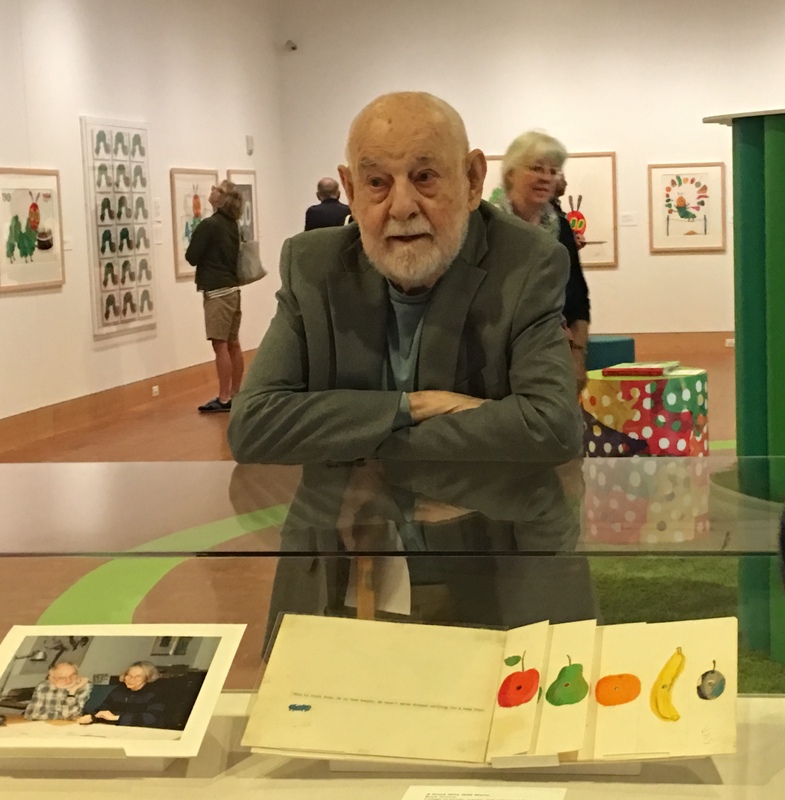 Happy 50th Anniversary to The Very Hungry Caterpillar. This entry was posted in Book Review, books, children's books, Early Education, Eric Carle, history, picture books, preschool, reading aloud, reading aloud, The Arts and tagged children's books, Eric Carle, picture books, Reading to children, The Very Hungry Caterpillar, The Very Hungry Caterpillar turns 50. Bookmark the permalink. I just love this book and all the learning we Can squeeze from its few pages!!! An amazing book, one every child should read. I don’t know a child who hasn’t loved this. I enjoyed reading this book to my children and grandchildren (in English, but they also had it in German). My kids used to love that book! This book is one of my favourites, Jennie, together with The Gruffalo. Thank you for the reminder. Thanks, Robbie. I love The Gruffalo! It is, Pete. Thank you! How fabulous! Thanks for sharing this delight, Jennie. I remember hearing this title at some point. But I’m only familiar with a couple of children’s books. I love the part about the hole-punch. This is a marvelous post. Hugs on the wing. Thank you, Teagan. I think the hole punch is one of the best parts, too! I’ve bought so many copies of that book as baby gifts and still want to pick it up when I go to the bookstore. It brings out the child in me as well. I’m glad to hear that, Marlene. Any book that brings out the child in us is great book! Here is a lovely post from Jennie about a wonderful children’s book. I miss the days when a writer like Carle could come from the rank and file to dazzle us with a charming story instead of having countless celebrities taking all of the new title slots for children’s books….I wonder how much more we are missing…. We are missing quite a lot! When publishers look at selling books above a good story it is sad. I know, publishing is a business, but celebrity stories?? Some stories never loose their impact. Yup! The good ones certainly don’t.